From the Department of Radiology, Northwestern Memorial Hospital, Olson Pavilion, 710 N Fairbanks Court, Chicago, IL, 60611. Summary: We report a case of an unusually prominent persistent notochordal canal involving the T12–L5 vertebrae. 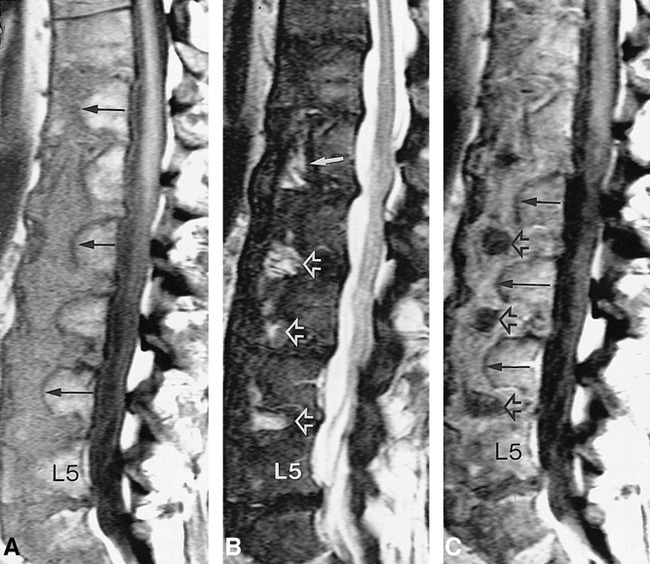 This rare anatomic variation was discovered as an incidental finding in a patient with lymphoma undergoing MR imaging for evaluation of back pain. MR images showed a vertically oriented canal contiguous with the intervertebral disks traversing the anterior aspect of each affected vertebral body. Plain films showed a sclerotic rimmed central channel that flared at each vertebral endplate to merge with the disk spaces. Persistence of the notochordal canal is a rare anomaly. Only 20 cases have been reported in the literature and only one previous report describes findings on MR images (1). Although it has been cited as a structural route for the spread of infection from one disk level to another (2), it is usually asymptomatic and discovered as an incidental finding with imaging. Prior reports have all described persistent notochordal canals restricted to one or two vertebral levels (1–3). This case is unusual, considering the extent of the canal and the resultant alteration in the appearance of the vertebral column. A 38-year-old man with acute lymphoblastic lymphoma underwent MR imaging for evaluation of back pain. The patient had recently received four cycles of L-asparaginase. Findings from a bone marrow biopsy performed 1 month previously were negative for metastases. MR imaging was performed and showed a vertically oriented canal traversing the anterior aspect of the T12–L5 vertebrae. The canal measured approximately 13 mm in the anteroposterior dimension and flared at the endplates to merge with the intervertebral disks. Although the intravertebral portion of the canal was not identified at S1, the S1–S2 disk showed signal characteristics similar to those involved by the canal, suggesting partial regression of the canal at this level. The signal intensity of the canal on T1-weighted images (Fig 1A) was slightly lower than that of normal vertebral body bone marrow. On T2-weighted images (Fig 1B), the canal appeared lower in signal intensity than vertebral body bone marrow. Within the canal, a hyperintense, rounded component centered at the disk spaces was seen extending vertically superiorly and inferiorly into the intravertebral portion of the canal. Contrast-enhanced T1-weighted images revealed homogeneous enhancement of the canal except for the rounded central component at each disk space, which did not enhance (Fig 1C). No abnormal enhancement was observed in the vertebral bone marrow, spinal cord, or leptomeninges. Low signal bordering the canal on T1- and T2-weighted images was consistent with sclerosis. A, Sagittal T1-weighted (522/15/4; TR/TE/excitations) MR image shows a vertically oriented canal (arrows) spanning T12–L5 vertebrae. The intravertebral canal is similar in signal to the intervertebral canal. Note the well-defined low signal outlining the periphery of the canal, compatible with sclerosis. B, Sagittal T2-weighted (2700/220/4) MR image shows hyperintense, rounded central components at the disk spaces (open arrows), corresponding to the nuclei pulposi. Hyperintense signal extends for a short segment superiorly and inferiorly into the intravertebral portions of the canal (solid arrow). C, Sagittal contrast-enhanced T1-weighted (522/15/4) MR image shows enhancement of the canal (solid arrows). The rounded central components at the disk spaces (open arrows), corresponding to the nuclei pulposi, do not enhance. 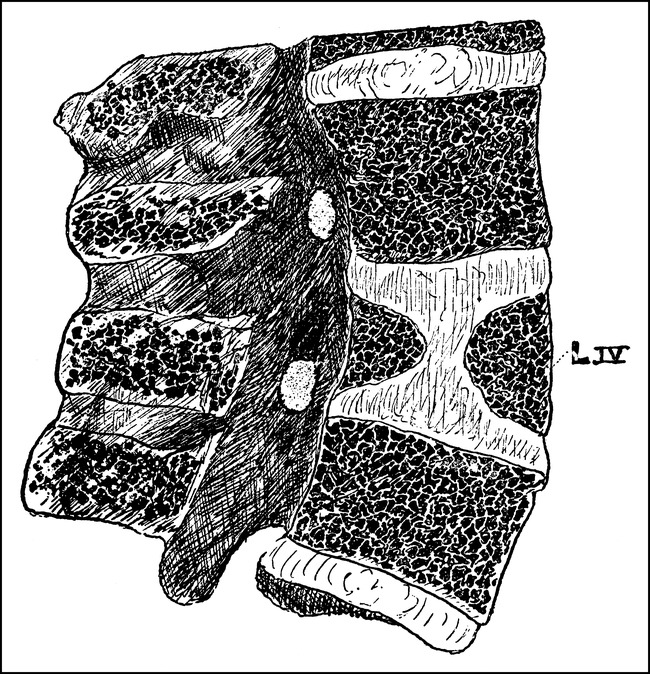 Plain films of the lumbar spine were obtained and confirmed the presence of the sclerotic rimmed canal within the anterior aspects of the T12–L5 vertebrae (Fig 2). The patient completed his course of chemotherapy and was discharged home. His back symptoms were stable at the 6-week follow-up examination. The pathologic appearance of a persistent notochordal canal is very characteristic. It was first described in 1891 by Musgrove (3). An anatomic section through the L4 vertebrae showed a “core of unossified tissue, resembling the appearance of an intervertebral disc” (Fig 3). The radiographic, CT, and MR appearances have been described (1, 2) and are also quite characteristic. Reports of previous cases describe a canal traversing one or two vertebral bodies. The notochord forms after the third week of development. The presence of the notochord induces the formation of the neural plate and serves as a scaffold on which the axial skeleton will develop. At the fourth week, mesenchymal sclerotomes surround the spinal cord and notochord to form the vertebral body. These sclerotome segments are separated by less dense tissue called intersegmental tissue, containing the intersegmental arteries (Fig 4A). As the caudal portion of each sclerotome proliferates, the intersegmental tissue is incorporated into the precartilaginous vertebral body. As the vertebral body forms, mesenchymal cells, which fill the spaces between the precartilaginous vertebrae, contribute to the formation of the intervertebral disk (4) (Fig 4B). Diagrams showing normal development of the vertebral column (adapted from Moore ). A, At 4 weeks' gestation, the vertebral body develops around the notochord. Each mesenchymal segment contributes to the formation of the vertebrae above and below and to the formation of the intervertebral disk. B, At 5 weeks' gestation, development of the vertebral centrum is complete and the notochord regresses. The notochord initially is a well-defined column of polygonal-shaped cells in an acellular mucoid matrix. During embryonic development, the notochord undergoes a series of changes, including proliferation at the disk spaces, regression of the intravertebral segment, and angulation and flexure that corresponds to the curvature of the mature vertebral column. Notochordal cells usually regress entirely in the region of the vertebral bodies during the cartilaginous stage. The sheath surrounding the canal usually disappears as the vertebral body ossifies. In the early stages of development of the intervertebral disks, the notochord is surrounded by primitive embryonic cartilage as it traverses the developing vertebral bodies and primitive disk spaces (Fig 5A). The intervertebral disk develops as concentric layers of differentiated fibrocartilage move peripherally from the central, less differentiated, tissue surrounding the notochord (Fig 5B). At term, no residual notochord is present within the vertebral body. The central portion of the disk is composed of the nucleus pulposus surrounded by perinotochordal specialized embryonic cartilage. The periphery of the disk is composed of the well-formed annulus fibrosus and Sharpey's fibers (Fig 5C). 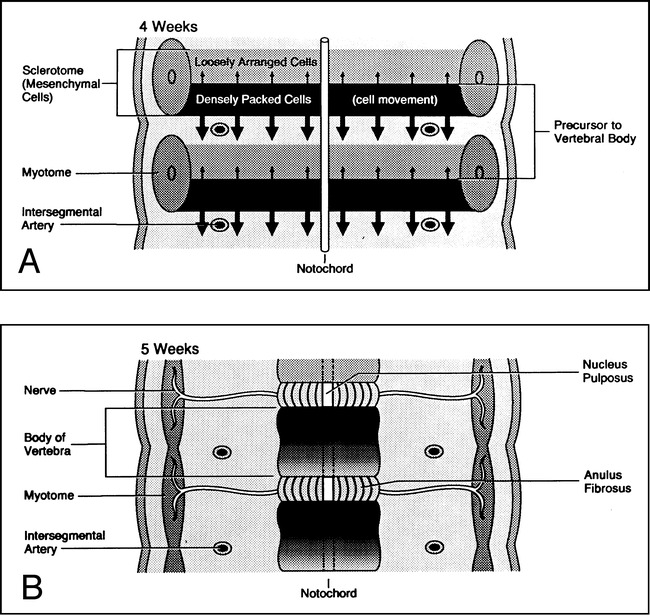 It has been suggested that the continued presence of notochordal cells within the developing vertebral body alters the differentiation of the mesenchymal cells surrounding the notochord. This perinotochordal specialized embryonic cartilage does not undergo ossification, resulting in the cartilaginous canal described on histopathologic examination of vertebrae containing a persistent notochordal canal (5). Schematic showing normal development of the intervertebral disk (adapted from Peacock ). A, 15-mm embryo: mesenchymal cells that will form the intervertebral disks are arranged in parallel rows. The cells toward the center are more rounded and are irregularly arranged around the notochord. They have more intercellular substance between them and contain small capsules of cartilage, referred to as specialized embryonic cartilage. B, 29-mm embryo: at the disk periphery, fibers of the annulus fibrosus are now present. These fibers run in parallel rows and cross the disk space; their terminations are lost in the adjacent vertebrae. More mature fibrocartilage is now present at the periphery of the specialized embryonic cartilage. Polygonal-shaped notochordal cells centrally are loosely arranged around an amorphous mucoid matrix. C, Full term: bony trabeculae and intertrabecular marrow have developed within the vertebral body. No vestige of the intravertebral notochord is present. The notochordal region within the center of the intervertebral disk contains a faintly basophilic homogeneous mucoid substance. Small groups of residual notochordal cells can be found. At the circumference of the notochordal area, small groups of fibrocartilage are surrounded by the fibers of the annulus fibrosus. The MR features of this case reveal several interesting points concerning the notochordal canal. It seems from the relationship of the notochord to the developing intervertebral disk that an abnormality of the notochord would result in an abnormality of the disk. Yet our patient had a normal nucleus pulposus, seen on T2-weighted images as a well-defined rounded central area of higher signal surrounded by a column of lower signal intensity cartilage in the region of the canal (6, 7). The presence of a normal-appearing nucleus pulposus suggests that the alteration in development involved primarily the cells surrounding the intravertebral portion of the notochord but did not affect the formation of the nucleus pulposus. The other feature that is demonstrated by this case is the homogeneous enhancement of the canal. The enhancement is not likely related to an infectious or neoplastic process, since it only involved the canal and did not involve the nucleus pulposus or vertebral bone marrow. Furthermore, the patient's back symptoms remained stable at follow-up examination. The lack of progression would not be typical for infection or tumor. Studies of the developing intervertebral disk have shown that the notochord and surrounding tissues remain avascular until term, at which time small vessels are present at the periphery of the cartilage plates. Although the origin of the enhancement of the canal is not certain, it may be related to vascularization of the metaphyseal cartilage columns surrounding the canal. The nucleus pulposus is initially produced by mucoid degeneration of notochordal cells, and after birth is modified by the addition of fibers and cartilage cells. Although the intervertebral disk is highly vascularized up to 25 years of age, none of these vessels enter the nucleus pulposus. Instead, these vessels run within the cartilaginous plates (5). Thus, the cartilaginous disk is vascularized whereas the nucleus pulposus is an avascular structure throughout much of adult life. The lack of enhancement of the nucleus pulposus is further evidence that its development was normal (5, 8, 9). The notochord in the early stages is found centrally within the cartilaginous vertebral body, but when the embryo is approximately 10 mm it is more ventrally placed and maintains this position throughout fetal development. In the adult, the location of the nucleus pulposus is dorsal within the intervertebral disk. This is related to preferential growth of the ventral vertebral body and disk, resulting in a dorsally positioned nucleus pulposus (5). The nucleus pulposus in this patient remained within the anterior aspect of the intervertebral disk, suggesting an alteration in the growth of the vertebra and disk because of the continued presence of the notochord. The presence of a notochordal canal may result in a change in the shape of the vertebral body seen on plain films, CT scans, or MR images. In some instances, the presence of a persistent notochordal canal may not result in an appreciable change in the plain film appearance of the vertebral body and may be evident only on CT or MR studies. The true frequency of this malformation may be underestimated. Taylor (8) studied 57 apparently normal spines in fetuses, infants, and children ranging in age from 25 weeks' gestation to 10 years, and described traces of notochordal canal residua in four, resulting in an estimated frequency of 7%. This type of residual notochordal canal is not the anomaly observed in adults. None were identified in specimens from patients older than 10 months, and the configuration was different (endplates biconvex rather than biconcave). Taylor postulated that this form of canal is a “pseudo-persistent canal” due to a transient delay in ossification, not a persistent notochordal canal. The malformation observed in the adult is far less common and represents true persistence of notochordal elements. Perhaps as additional cases of a persistent notochordal canal are investigated with MR imaging, the developmental alterations resulting in this malformation and an explanation for the enhancement characteristics will become more apparent. ↵1 Address reprint requests to Barry M. Rabin, MD. Accepted after revision May 8, 1998.